Crested floating heart is a freshwater floating perennial with stolons (runners) that aggressively root in the substrate; but can temporarily be free floating. Clusters of tuberous propagules dangle from the node where the stem connects to the leaf and can be used to identify this species when not flowering. Most of the leaves are floating, although some remain submersed. The floating leaves are cordate to sub-round with rounded leaf bases (i.e., somewhat heart shaped) and are purplish underneath. Flowers are white with five petals, each of which has fringed edges and a longitudinal, ruffled crest, and range in size from 0.3 – 0.9 inches (0.75 – 2.5 cm) wide. Flowers are held singly above the water surface on a peduncle (stalk). Ecological Threat: Crested floating heart grows rapidly, covering the entire surface of the water and shading out and outcompeting native vegetation. Decomposing vegetation impacts water quality and other aquatic species and shading can cause severe declines in algae, disrupting the entire food web. Biology & Spread: Crested floating heart reproduces vegetatively, producing daughter plants that break off and float to new areas. This species can also spread via rhizomes and tubers known as ‘ramets’. Fragments, ramets, and rhizomes are frequently spread by boats and their anchors, resulting in new introductions. Although this species produces seeds, viable seed production has not been documented in the U.S.
History: Crested floating heart was intentionally introduced in the U.S. as an ornamental plant in water gardens and escaped captivity. This species is still widely available from online sellers, despite being highly invasive, and is often sold under the common name snowflake.’ This species is also introduced to new locations when fragments are transported on boats. U.S. Habitat: Slow-moving, still, shallow bodies of water including ponds, lakes, reservoirs, swamps, rivers, and canals, in depths of up to nearly 9 feet (3 m). It grows best in sandy hydrosoils, but high nutrient availability can enable this species to thrive in muck sediments. Little is known about the effects of pH on this species’ growth although some research suggests it may grow best in acidic sediments. Crested floating heart is a tropical/subtropical plant and is likely to be limited to USDA Plant Hardiness Zones 8-13 and areas with ≥ 40 inches of annual rainfall; a USDA weed risk assessment for this species indicates high risk of establishment in east Texas. Native Origin: India, Vietnam, Taiwan, southern China. Crested floating heart resembles native big floating heart a.k.a. banana lily (Nymphoides aquatic), and invasive yellow floating heart (N. peltata) but can be distinguished by the ruffle-like crest running the length of each white flower petal and/or the cluster of tuberous propagules dangling from the stem-leaf node. 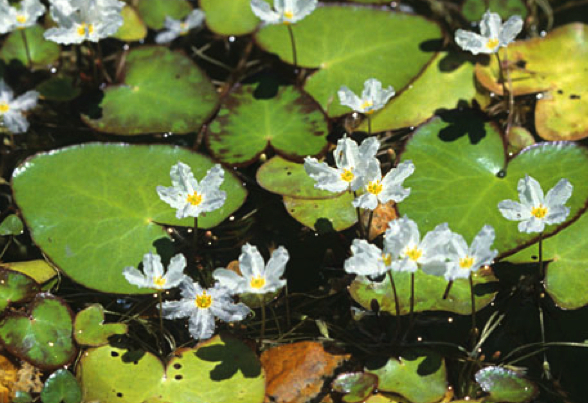 Other alternatives (besides banana lily) include little floating heart (Nymphoides cordata; native to the U.S. but not TX, not invasive), native spatterdock a.k.a. cow lily (Nuphar lutea ssp. Advena), and American white water lily (Nymphaea odorata). Prevention is the best management practice—clean, drain and dry boats, trailers, and equipment to prevent spreading this species. Physical and mechanical control methods are largely ineffective and counterproductive, as mechanical methods serve to spread fragments to new areas and the roots and rhizomes are able to survive and resprout. Raking or cutting might help temporarily clear areas for boater access, but repeated cutting each season would be required. There are no known biological controls for this species; grass carp do not readily consume this plant. Chemical treatment often kills foliage but leaves tubers or rhizomes alive to resprout and crested floating heart has been shown to be tolerant of most aquatic herbicides. However, diquat, endothall (amine salt), imazamox, imazapyr, and some combinations thereof have been found to be somewhat effective for controlling this species (see Willey 2012; Willey & Langeland, 2011). Temporary control can be achieved using glyphosate and imazapyr, but control is short-lived (up to 4 weeks), re-treatment is required, regrowth is rapid, and tuber clusters survive and resprout. Foliar application of glyphosate and imazamox in combination may provide the best degree of control in both shallow and deeper waters with minimal regrowth.